Finally managed to get into AVR programming. Using OSX, which I found as the worst platform for doing any kind of embed programming :( Sad. Anyway, there’s my first ATtiny schematics and code. 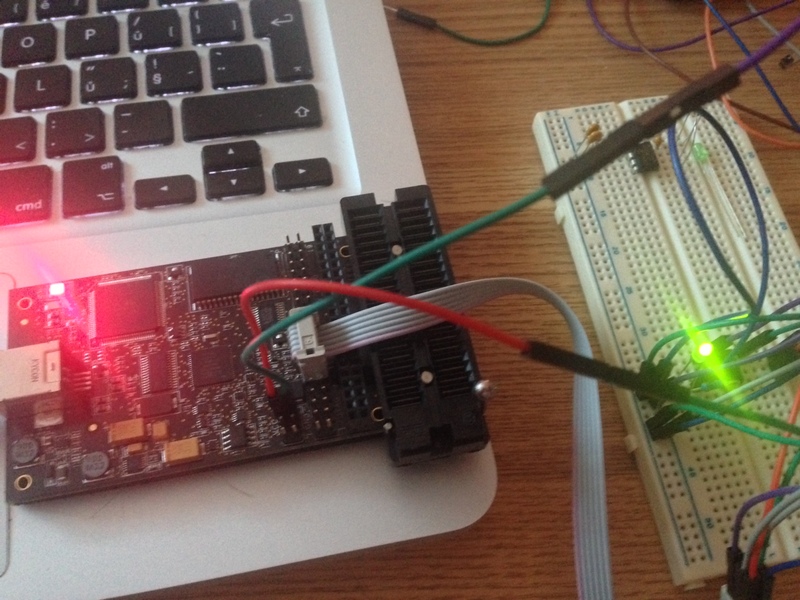 I’m using AVR Dragon to flash code into the MCU. Now we can compile the firmware and upload to our MCU. $ make flash avrdude -c dragon_isp -P usb -p attiny13 -U flash:w:main.hex:i avrdude: AVR device initialized and ready to accept instructions Reading | ################################################## | 100% 0.15s avrdude: Device signature = 0x1e9007 avrdude: NOTE: "flash" memory has been specified, an erase cycle will be performed To disable this feature, specify the -D option. avrdude: erasing chip avrdude: reading input file "main.hex" avrdude: writing flash (110 bytes): Writing | ################################################## | 100% 0.46s avrdude: 110 bytes of flash written avrdude: verifying flash memory against main.hex: avrdude: load data flash data from input file main.hex: avrdude: input file main.hex contains 110 bytes avrdude: reading on-chip flash data: Reading | ################################################## | 100% 0.47s avrdude: verifying ... avrdude: 110 bytes of flash verified avrdude: safemode: Fuses OK (H:FF, E:FF, L:6A) avrdude done. Thank you. and I made some commented assembler output (base is taken from avr-objdump -S main.elf). LPCXpresso finally beaten. Installed new v5, imported all the CMSIS needed and setup brand new, my very first, MCU example code :) I’m using LPC1769 sample board from Embedded Artists. // by the linker when "Enable Code Read Protect" selected. ;;; for notes about the program and how to assemble, link, and burn to flash. ;;; (or any LPC17xx ARM board with perhaps minor modifications). ;;; on when P0.22 is high.